Effective suspension travel control is a critical element to all off-road suspension systems. Conventional bump stops may be acceptable for stock street applications, but off-road enthusiasts need something tunable and much stronger than conventional stops. 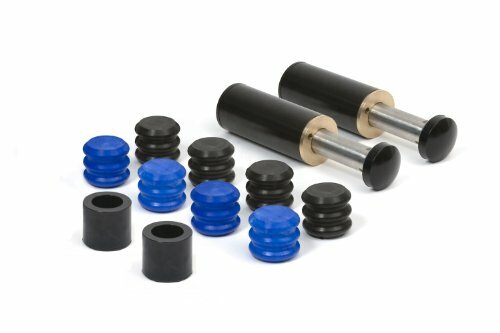 Daystar’s Stinger bump stops now offer total suspension control in one affordable package. Inspired by race bump stops that are used in many different off-road niches, Daystar Stinger bump stops use Daystar’s revolutionary EVS foam technology. EVS is a microcellular foam material that is available in two different densities. EVS has a true progressive spring rate and is designed to be cycled thousands of times without degrading. Each Stinger bump stop can carry between one and three EVS foam inserts, allowing the user to easily adjust the firmness of the bump stops. Combine the different densities of the EVS material available with the adjustability of the Stinger piston shaft, and you have a bump stop that can be adapted to all needs and uses. The outer shell of the Stinger is machined from heavy gauge tubing, while the bronze guide for the piston shaft ensures long life. Thanks to the overall design, Stinger bump stops are fully rebuildable. Stinger Bump Stops are a fraction of the cost of nitrogen-charged bump stops while offering the same performance attributes. Daystar Stinger bump stops are sold in two different lengths, making them adaptable to just about any vehicle. They also work with most racing-style 2 - inch 'bump can' mounts, while weld-on mounts are available separately. If you have any questions about this product by Daystar, contact us by completing and submitting the form below. If you are looking for a specif part number, please include it with your message.